Priya, what was your background before yoga? Well, if we’re speaking about yoga in its truest sense, I think that state of higher consciousness is present within us before we even come into our physical bodies, as we choose our soul’s purpose for this incarnation while still in another realm. Once we “arrive” into this form, it’s all about remembering and seeking; a lifelong pursuit to once again know and fulfill that truth, and reconnect with the divine, universal consciousness. We come from and return to, the source. If yoga is indeed this union, it has been a part of my path from the very beginning of this life, and perhaps many lifetimes before. Who knows when the journey began. My belief is that we are born into certain families for a reason, based on our past karma, and this provides us with the opportunities needed to pursue and advance our goals, spiritual or otherwise. It is up to us to embrace these relationships and allow them to teach us the lessons that we need to learn to move forward, as we work through the karmas that we have accumulated. So, to try to answer your question, I’ll start with a little bit about my familial background. My parents immigrated to the United States from India in 1970. My dad, a chemical engineer, wanted to attend MIT for his graduate studies. Like many others, he and my mom left their families and the comforts of home to seek out greater opportunities. My sister and I were born in the United States. Being first generation Indian Americans, our parents pushed us pretty hard in academics. As children, my sister and I would wake up at 7 am on weekends to learn advanced math and science with my dad. We would sit on the floor of the living room with notebooks in our laps for hours at a time (I recall my dad would be seated in padmasana or half padmasana), working out complex problems that my dad would assign us. No bathroom breaks. No food breaks. He was pretty militant when it came to studies. I guess this was one of my earliest experiences of tapas. How long have you lived in the shop home and operated Ashtanga Yoga? Do you operate the yoga studio by yourself? We moved into our shop home in November 2015. Actually, my husband, Darshan, moved us in while I was in India at the time, studying with my yoga teacher, Sharath Jois. I try to spend 2 months each year in India with him, continuing my own studies and immersing in practice. I returned from India in January 2016, and opened Ashtanga Yoga Austin on February 1, 2016. I was running the Shala by myself for the first year, but my husband has provided tremendous support from the very start. Teaching from 6-9 am daily during the weekdays and 8-11 am on Sundays required both of us to commit to a certain lifestyle. I would wake at 3:15 am to shower and get ready so that I could complete my own practice from 4-6 am before teaching. Because the practice of yoga is not just physical, but rather a spiritual/energetic practice, I believe it is important to cultivate that energy in myself before teaching and transmitting to others. Waking at these hours means foregoing late nights, amongst other things, and winding down quite early. The practice, however, has truly transformed our lives. The sacrifices that we have made to run the Shala and share with our community are well worth it. In the fall of 2016, I started apprenticing two of my students, both of whom have also made the pilgrimage to Mysore, India to study Ashtanga Yoga at its source. After several months in the Shala with me, practicing in the wee hours of the morning before observing and assisting, they started covering the program last April when our baby girl was born. They have been assisting me in teaching classes ever since. What is the difference between ashtanga and other forms of yoga? Should I be intimidated if I’ve only gone to a vinyasa or beginner class? Ashtanga Yoga is a philosophical system comprised of eight limbs that include yama, niyama, asana, pranayama, prathyahara, dharana, dhyana, and samadhi. Ashtanga refers both to this eight-limbed path, and a particular style of practice. If you were to ask someone in India what “Ashtanga Yoga” is, they would assume that you are asking about the eight-limbed path. In the West, they would assume you are asking about the style. So just to be clear for our readers, what we are speaking about here is in regards to Ashtanga as a style of practice, which focuses on the third limb, the asana, or physical postures of yoga. Ashtanga Yoga follows a fixed sequence of postures. It is a dynamic practice that synchronizes breath and movement to produce an internal heat that dispels toxins and purifies the body. The method was founded by Sri K. Pattabhi Jois of Mysore, India. As he began to teach westerners from his home in Mysore, the teachings of Ashtanga Yoga slowly began to spread around the world. Thus, we call the traditional method “Mysore-style,” meaning that teachings are transmitted directly from teacher to student, on a one-to-one basis. This transmission which occurs from guru to shishya, from teacher to student, is the age old way of passing knowledge according to parampara—through direct, unbroken transmission from one generation to the next. This is how yoga was classically taught. It is how I learn from my guru, how he learned from his guru, and so on and so forth… the chain of transmission goes back many generations. Maintaining this tradition and link is important to me. That is why I continue to go and study in Mysore with my teacher, Sharath Jois, who grew up practicing under the watchful eye of his grandfather, Pattabhi Jois, and is the current lineage holder of Ashtanga Yoga. I opened our Shala after receiving his blessing to do so, and teach as I have learned from him in India. Students who have never been in a Mysore room often feel nervous about getting started. It’s a very normal feeling, but there is nothing to be afraid of. It is very empowering, actually, to receive direct personal guidance, and ultimately become responsible for one’s own practice. Mysore classes are suitable for practitioners of all levels, from absolute beginner to advanced. Postures are taught one at a time, with detailed instruction regarding each breath and movement, and even where the gaze should be in each posture. This helps to increase one’s focus and concentration, thereby stilling the mind. As the student learns and remembers a posture, and becomes proficient in its practice, additional postures are introduced. In this way, students gradually build up their practice over time, as well as the necessary strength, stamina and flexibility, while continuing to receive individualized instruction and adjustments to fit their needs and ability. Students come into the Shala at their assigned time, roll out their mat, and begin their practice at their own pace under the teacher’s supervision. The room is mostly quiet aside from the sound of breath and occasional instruction between teacher and student, which further lends to the meditative quality of the practice. And while each student is completely immersed in their own practice, there is a shared energy in the room that is quite palpable. On a regular basis, students who have been practicing consistently and have reached a certain proficiency are invited to participate in a led class, where the pace of postures is synchronized to the teacher’s count. Led classes are guided group classes, wherein the teacher leads students through the practice as a group, while counting out the names of the postures and vinyasas in Sanskrit. Even in this setting, students only go as far as they do in their daily Mysore practice. Everyone gets to experience what the pace of the practice should ultimately be like and observe whether they have internalized the practice well. Students who practice other styles of yoga will sometimes drop into a led Ashtanga Yoga class at studios where this is offered. Without regard to proficiency, students are led through the entire series of postures all at once. Commonly, students unfamiliar with the practice find the pace and postures to be challenging and difficult—they leave with a feeling that the practice is not for them. I would encourage those who have had such an experience to try again in a Mysore setting where there is individualized instruction on a one-to-one basis. Do I have to buy a membership to the class? Why can’t I just drop by a yoga class? What is the best way for me to try out ashtanga yoga without having to commit? Students enroll in our Mysore program on a monthly basis. We don’t offer “drop-in” classes. Because of the nature of Mysore-style teaching, consistency is very important and I require a practice commitment of at least 3 times per week. I vest myself in my students’ practices, as do my assistant teachers, and I expect students to do the same. Being entrusted to guide students along on this path, I also feel that I must protect the energy of the space so that students feel safe in this environment. For this reason as well, I do not allow for drop-ins. The best way to try it out is to commit for at least a month. I encourage interested students who have uncertainties to come and observe a class to get a better sense for how the Mysore method works. I also interview each student that I accept into the program. This enables me to determine whether we feel we are a good fit to work together and have similar intentions for practice. All this helps to cultivate a positive, steady energy in our Shala, which I feel is very important to developing a spiritual practice, or sadhana. When we spoke you mentioned about yoga being a lifestyle, in relation to Darshan’s business as well. Can you share more about your view of yoga as relating to an entire way of being, not just something that is done on the mat? “Ashtanga” means “eight limbs.” The first two limbs of yoga are known as yama and niyama. These are ethical guidelines for living a yogic life. For example, speaking the truth, not harming others, not stealing, etc. The third limb is known as “asana,” or the physical postures of yoga. It is just one aspect of yoga practice. Without integrating the yamas and niyamas into our daily life, this third limb is simply a form of exercise and does not make us better human beings. My teacher often says, “What we do on our mat is for 2 hours. But yoga should be happening within you 24 hours a day.” We live our yoga in the way we speak, the way we interact with others, the way we care for our environment, in what we choose to eat, and in all our daily choices and activities. Learning to control our behavior through yama and niyama, our body through asana, and our breath through pranayama, we build a strong foundation for practice of the remaining four limbs. As we become grounded in the external limbs, the inner limbs of pratyahara (withdrawal of the senses; turning inward), dharana (concentration), dhyana (meditation) and samadhi (complete absorption and realization of higher consciousness) may be cultivated. By integrating these principles of yoga into our daily living, we begin to see yoga as more than a physical practice; we begin to see yoga as a way of life. However, this is not to say that the physical practice is not important. Every morning it is something that gives us energy and vitality. What we do on our mat trains and prepares us to go through the rest of our day with equanimity. As we learn to breathe through difficult postures, we are better equipped to breathe our way through difficult times in life. What inspired you to get into yoga? Talk to me about how the transition from yoga teacher to yoga teacher/mother has felt and inspired you in your practice? I grew up with yoga philosophy. My mom imparted that to me throughout my childhood. I didn’t come to associate yoga as a physical practice until years later. After almost 17 years of practicing yoga asana, my perspective and practice has shifted once again since giving birth to my daughter, Vira, last April. Within the Ashtanga Yoga method, there are six series of postures, and each gets progressively more advanced. 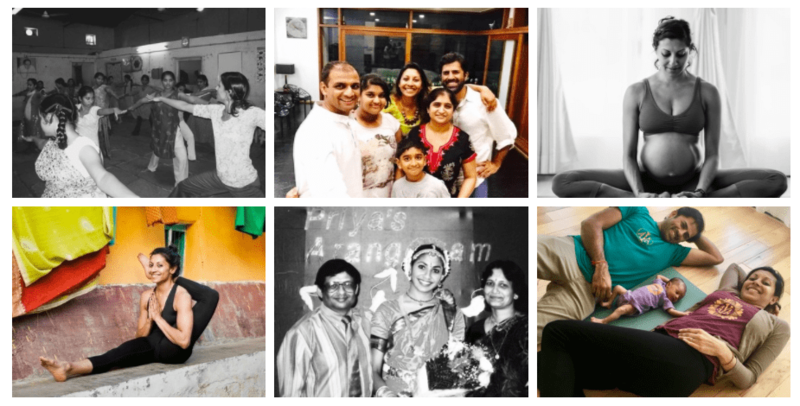 Yoga Guru Pattabhi Jois called family life the “Seventh Series” of Ashtanga Yoga. I agree that this has been the most challenging, and rewarding, practice of all so far. Almost immediately my own needs and wants became secondary to those of my daughter. The luxury of time disappears when nursing every hour. Having a child subdues one’s ego and gives new meaning to the idea of selfless love. It’s not about me anymore. It has all been very humbling. And awe-inspiring. As a teacher and a mother, I believe the most significant guidance I can provide is by the way that I lead my life, exemplifying the yamas and niyamas. This is true for Darshan as well, in his practice as a physician, and now ever-so-importantly as a father. We both strive to model the kind of behavior that we seek to guide our daughter and our communities in. What else would you like to share with the readers of the Mueller community? A “shala” is a home; a gathering place. Ours is a home for students interested in going deeper—into their practice, into themselves. Everyone has their own path, and I believe there is a right time and place for everything. As such, I do not believe in soliciting students and do not aspire to bring every potential student through our doors. Even after nearly 17 years of practice, I continue go to India regularly to study with my teacher for extended periods of time, and will always be a student. The student-teacher relationship is at the heart of the traditional Ashtanga Yoga method. Just as I sought out my teacher when the time was right for me, I hope others will similarly find their teacher, through such earnest seeking.